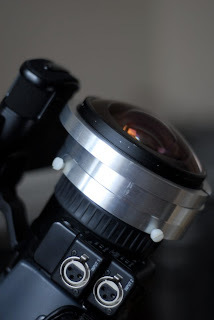 To try and squeeze a few more pixels out of the Z1, we have had an adapter made to shift the lens forward and up. Adrian - from Brunel Engineering labs did a fantastic job creating the adapter - I wish Sony worked to the same tolerances! Looking at the most recent footage from the camera, I still think the HDV CODEC stinks. I can't believe that people all over the planet are signing its praises. Today, in a review of the Sony V1, I read that the BBC are using it. Maybe FullDome asks too much of it, but I don't think I'm alone - Panasonic obviously don't think much of it either - preferring to drop tape altogether for their HD camera and to go with their P2 solid state cards, in order to get enough bandwidth for a decent CODEC (DVCProHD). We were so ill-advised to buy the Sony! I noticed that the Sony has a component video output - I went searching for a way to capture that direct-to-disk - in an attempt to bypass the Tape/CODEC. I'm not the first. Even capturing SD would be better than the results from HDV.